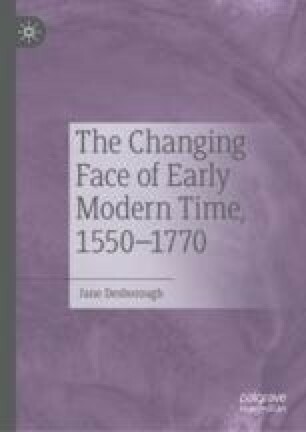 Clock and watch dials made in the period 1550–1770 are tantalising evidence of past use and connections to the wider context of early modern knowledge transmission, but the challenge remains of how to unlock their meaning. Decisions made about what to include on dials, such as the civil calendar, and later decisions as to what to leave out, such as the period of the day by the early-seventeenth century, were the results of changing user needs. By comparing dials with printed paper sources, we can identify changing uses of indices on dials that may at first seem to have changed very little throughout the period and gain a better understanding of why the standard format that emerged by 1770 looked the way that it did.